Running in the winter months isn’t for the faint of heart. Choosing the right layers and gear isn’t even the hard part (although that’s no joke, either). It’s finding the motivation to leave your cozy home behind and head out into the frigid (and possibly icy) conditions that lie in wait beyond your door that really poses the challenge. But here’s something that just might spark a little inspiration for your next workout. What if you had a chance to participate in a race with all your friends in a tropical land far away from the snow and slush outside your window? If you think that sounds pretty good right about now, you’re not alone. November, December and January are popular months for races in toasty destinations like Florida, the Bahamas and the Caribbean—and nobody is more aware of just how motivating these race-cations can be than Janicke Ziemer of Toronto, who began running—and, eventually, traveling to locations like Barbados and Jamaica—with a group of friends in 2004. That group, named The Running Girlz, began when Ziemer recruited a few friends to meet her on Saturday mornings to run. 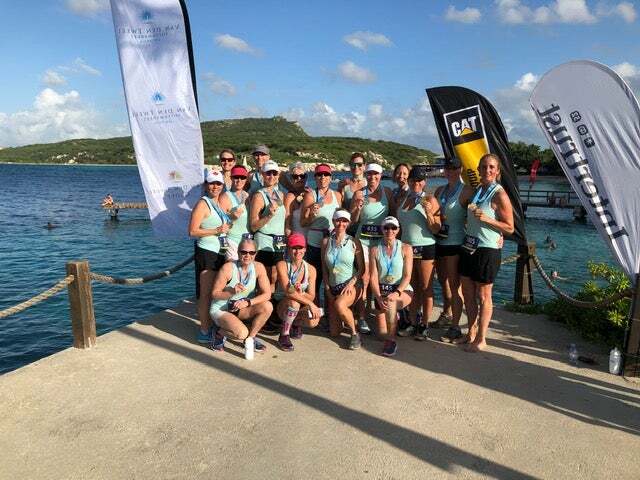 The group of seven quickly blossomed to a crew of more than 20, and after two years of consistent Saturday morning training sessions, the women decided to take their run on the road—nay, into the air—for a half marathon in Barbados. 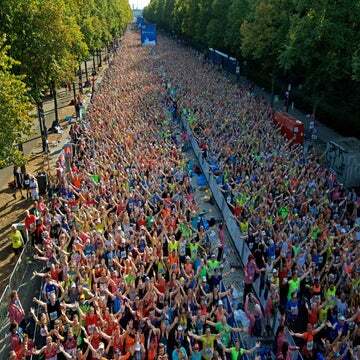 Think you might be interested in planning a race-cation for your own group of running buddies? Here’s a bit of advice that can help you start planning. Photo provided by The Running Girlz. Before any decisions are made, determine who’s going and what’s most important to each person. Are they looking for a PR or BQ, or are they more interested in the photo opportunities along the course? Do you want to plan a full week or just a long weekend, and are there any dates that won’t work? Budget is also an important factor, so it’s key to make sure everyone is on the same page. Hosting a kick-off meeting—either in person or virtually in real time—is a great way to start. From there, you can decide on the best way to keep everyone updated. Groups who run together regularly, like The Running Girlz, can hash out details over a post-run coffee, but if you can’t consistently meet in person, setting up something like a Facebook group, a Slack channel or a bi-weekly group call can be helpful. When you’re the only one racing, it’s easy to opt for a race that offers just one distance. If your group has trained together with the same goal in mind, then picking a single-distance event might be perfect. The larger your group, the more likely it is that someone will want to scale back—or up—on the distance, which makes race weekends with a variety of distances a great choice. Many of the Caribbean races in particular offer distances ranging from 5K to half or full marathon, and some even have a marathon relay option. Not every warm-weather getaway is equally accessible. Some Caribbean islands have multiple flights each day from the U.S. and Canada, but others have a limited number of flights each week, which can make group travel a challenge. If your budgets are tight, looking into the flight cost early on is wise. If you want to follow in The Running Girlz’s footsteps, you’ll also want to identify a location that does more than meet a minimum temperature and host a race. Will your group be content lounging by a beach or pool? Are you interested in exploring the nightlife? Is anyone interested in trying hiking, scuba diving, ziplining or water sports? Ironing out these details will help you determine the right destination and where in the area you should stay. 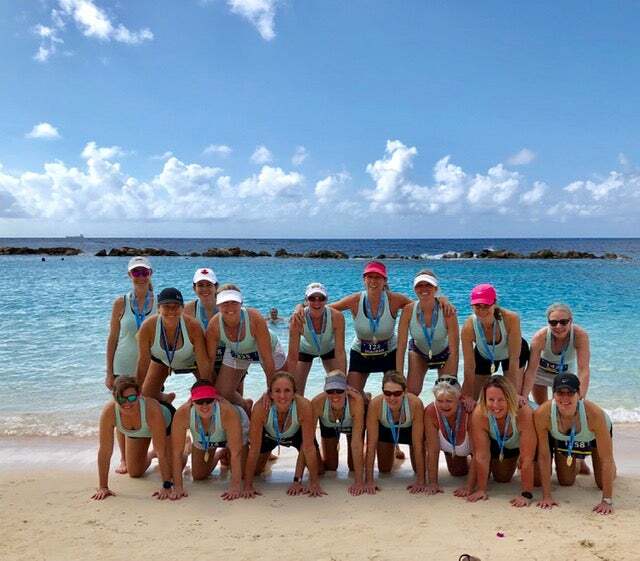 The Running Girlz are proponents of the all-inclusive resort when possible, finding that this kind of pick often saves money and requires less organizing upon arrival since there are no bills or cab fares to divvy up. But that’s not the only option. Sometimes the race’s host hotel offers a early booking deals, as was the case when Cara Wright, who lived in Italy at the time, signed up for a half Ironman triathlon in Pula, Croatia. She knew several of her training buddies would join her, so she booked a few rooms right away. “That first time, I made the mistake of not having people switch the rooms to their names as they signed up, so when we got there, we had five rooms under my name, which got complicated,” she recalls. She and her friends participated in the same race the following two years as well, and she made a point to have the hotel change the name on each reservation as people committed. If everyone is flying to the race-cation destination from different cities, you’ll need to determine what day everyone should arrive and depart and, if possible, choose flights with arrival and departure times as close together as possible. If everyone in your group is aiming to get on the same flight, this becomes a bit more complicated. You can all book separately, but plan to buy tickets at the same time to ensure the flight doesn’t fill up before your whole group is accounted for. You can also arrange to have one person book all the tickets together, or you can look into your airline’s group booking policy. If you’ll need groceries, order them ahead and have them delivered (if the option to do so exists in that location). This allows you to plan a grocery list ahead of time and have food available upon arrival. If flying, have everyone bring their race-day necessities in a carry-on bag rather than their checked luggage. If you’re arriving shortly before the race, look into packet pickup options. You don’t want to miss out on the race just because you didn’t read the fine print about mandatory pickup times. Figure out ahead of time how you’ll track costs and how and when group members will be reimbursed. Listing expenditures in a spreadsheet and settling the bill after the fact might work well, and using a payment app like PayPal, Zelle or Venmo can make the process quick and easy. Have someone take ownership of the most important details. Remember, just because you’ve all agreed that you want to go in on a shuttle from the airport doesn’t mean it’s been booked! When it comes to activities, don’t attempt to schedule everything for everybody. Discuss a few key outings during the planning process but leave plenty of time open for hanging out and relaxing, with the understanding that the entire group may not be together all the time.